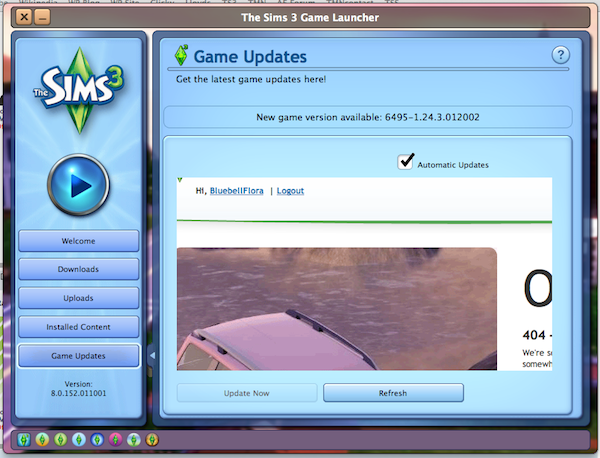 For my posts about OS X Lion and The Sims 3 see here, here and here. I think, and I’m no computer wiz, that the problem with the game freezing in Lion is a graphics card, specifically the Nvidia GeForce 9400 which is in Macs which are a couple of years old or so. One of the cards in my MacBoo Pro is the 9400. I switched over to it, started my game and it froze within minutes. I switched back over to the 9600 GT and it works fine again. If you have a 15″ or 17″ MacBook Pro with the above graphics card go to System Preferences > Energy Saver and change your graphics to Higher Performance. Your Mac will switch to the Nvidia GeForce 9600M GT. You should now be able to play. And the box states that the game will run on OS X Leopard 5.7 or higher. If EA don’t change this for Town Life and you can’t play your game, they have sold you a product which they are telling people won’t work. EA customer support are telling Mac users that TS3 will not run in Lion, to roll back to Snow Leopard. They’re wrong. Some of us Lion users are playing fine, we’re not using the Nvidia 9400 card. So if the text file still says that the Nvidia 9400 card is supported, it bloody shouldn’t be, at least not at the moment. It will help us to work out any other issues which may be causing the game to freeze. Thanks for the info. Well, looks like I wont be upgrading to Lion anytime soon as my MacBook has the Nvidia GeForce 9400 card. But I’m not too bothered by it. And at any rate it’s good that I found out that my card is incompatible now, rather than after installing Lion. Leaving me unable to play, that would be a disaster for me. Yes, I am that addicted to Sims. Sad, but true! I’m lucky I seen this before I went out to purchase Sims 3 today. Nearly paid £30 for it so I’ve saved a bit of cash. I’m still tempted to buy it though and see if it works for me as I came across your topic and I’m on a Mid-2010 MBP with a 512 330M and I seen a user listed there and it works for him. Unfortunately since I don’t own the game I wasn’t able to register and post a thanks there. I gave into temptation and bought the game, if I can’t play it now I’m hoping that it works soon. There’s a lot of people complaining about the update corrupting their game on the Facebook page so it might be worth making a copy of your Sims folder in Applications. Love EA’s attention to detail, so professional……. BTW, which Mac do you have? I suppose it may be due to the influx of people attempting to download it. Though its no excuse on EA’s part, they should be aware and prepared for the amount of users attempting to download the updates. I’ve got a 17 inch i7 MBP Mid-2010, cost me like £1900 with student discount, lol. Considering I can’t even access half of EA’s website unless I change my location to the USA, I’m not surprised the Launcher can’t find the update. EA need to be ripped apart and rebuilt, just like their shoddy games. I had that turned off already anyway but in theory that shouldn’t matter, that simply means that if you’re on battery it’ll attempt to save power and as most people plug their MBP’s in when playing it doesn’t apply. I’ve just finished installing the game now, gonna try updating ect. I’ll let you know how it all goes. It makes all the difference as you have 2 graphics cards in your MBP. It switches to the dedicated card when you need the power for higher graphics but obviously this results in less battery time. The main problem with Lion and TS3 seems to be the integrated card as opposed to the dedicated card. I have 2 cards in my MBP, and always have it set to the dedicated card because my game works fine using that one. When I switched to the integrated card bam! It froze. Apple just make it look energy efficient by calling it “Energy Saver” when in actual fact it’s the graphics power setting- I still get 4 hours battery out of my MBP which is now 20 months old when I’m on the dedicated card, not bad really. Yeah I know I was just saying most people plug their MacBooks in so it doesn’t really apply until you unplug it as thats when it’ll deactivate to the integrated card. For me, I think I only have 1 card, actually I’m quite positive and I’m quite happy about that with all the problems that’ve been happening with TS3. Just an update on my install, I’ve finished the game install and went to update. Seems to be installing fine so far, just clicked Game Updates > Update Now (if this is the way you’re talking about) and its just over half way downloading. Hope everything works for you soon. Have you had any luck downloading it yet? The update that just installed was a previous one so now I’m up to the version you’re on and I’m also getting the ‘Oops’ error. Nope, you have 2. Go to About this Mac and click on graphics/displays and you’ll see them both. Deactivating the automatic switching actually helped people run the game a while ago when another dodgy patch was released. So we can’t update? Brilliant EA, just bloody brilliant. Changed the country code, that didn’t work either. I’m not sure if I this the best place to post this, but I am unable to load Sims 3 pets past pushing the play button. It then closes itself out. I’ve already tried bypassing the launcher and uninstalling. Any ideas of how I can get this to work. No idea Kyla, sorry 😦 Sounds like it can’t find the relevant files to execute the game. Did you do a completely clean uninstall by trashing all the Transgaming Preference files in the Library folder? It’s the only way to fully uninstall TS3. After reading this, I’m still wondering if the Sims 3 would work on Lion OS Intel HD Graphics 3000 384MB… should I still risk buying TS3?